With his overwhelming charisma and unique guitar sound, Taiji Sato is the man behind the sound of the band THEATRE BROOK in which he is also indispensable as songwriter. Recently however, he has been working with the unit “Sun Paulo” (members: Taiji Sato+Sho Numazawa+Toshiyuki Mori) specializing in JAM- and dance music. 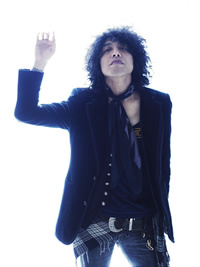 He has written songs for Chemistry, Leyona, and Mika Nakashima and has also produced such artists as Atsushi Sakurai, MCU, and Mariko Ide, Kiyoharu, tobaccojuice. In 2005 Taiji Sato hosted The Niigata Aid event in AX which was a great success. Besides music he has appeared in a commercial for BIG JOHN that was directed by Masashi Muto, as well as the motion picture “Artful Dodgers” directed by Sadao Yasuda. This year he started committing himself more to his solo project and released his solo debut album “The Divorced Rockstar” on May 14th.